Due to the high quality and beautiful nature of our products it is critical that our windows and doors be handled professionally and with care. It is for this reason that Parrett will make every reasonable effort to ship our beautiful windows or doors on our trucks. 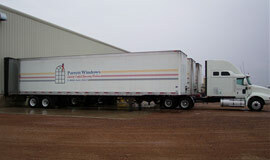 Our fleet of trucks are custom designed to provide a safe secure ride to the final destination. In the event that it is not practical for our trucks to travel to your location we will custom crate your product and ship via a proven, reputable common carrier.